How can I measure my tracks in the Changers CO2 fit challenges? What are the best pedometer, fitness trackers or apps? We get these questions more often and have therefore summarized the possibilities for you here. Changers offers in the app its own GPS distance measurement, which is started and stopped manually with the Start / Stop button, as you know it in Runtastic or Runkeeper. This will determine which of your tracks will be measured and which will not. TBH, this can be quite tedious, as you have to remember to start and stop the tracking before the run. Therefore you have as the next option the automatic recording of all paths covered by foot through the built-in smartphone pedometer. If this does not have a pedometer – which is still possible in 2018 – you will not be offered the option “connect to the pedometer” in the tracking settings. Then you would have to activate the following tracking method using Google Fit. To anticipate, we’re big fans of Google Fit and would be very happy if Apple were just as far as Google Fit with its health app counterpart. Because the good thing about Google Fit is that it captures everything on foot AND even on bike-driven routes. Unfortunately, Apple Health only records the walking and running routes automatically. For rides on the bike, you need to use another tracker such as Changers GPS Tracking, Fitness Apps like Strava or Endomondo, or a suitable wearable like Garmin. Unfortunately, we do not know why Apple does not enable the function of the automatic bicycle tracker. We hope with every newly released iOS version that Apple has a good look. 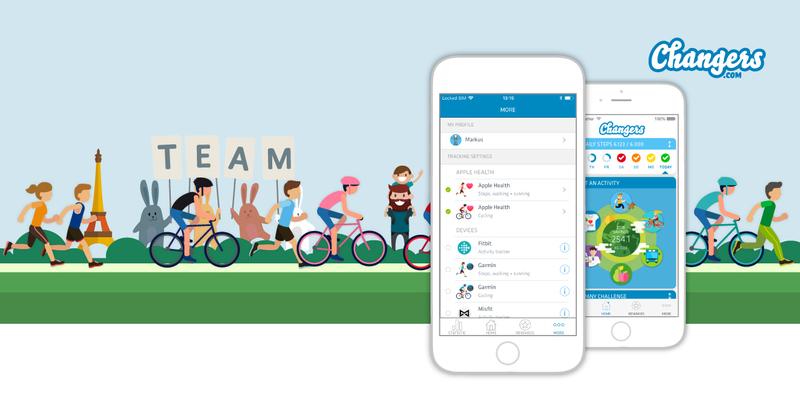 If you already have a favorite tracking app for your bike tours, you can confidently link them to Apple Health. The data is then automatically transferred to your changer account, so you do not need to measure the same distance with two apps. The most popular apps include Runtastic, Runkeeper, Endomondo, Strava or Nike +. But many wearables such as the Apple Watch, Polar, Xiomi or the tracker from Wahoo can be connected to your Changers account. Connect Garmin, Fitbit and Misfit Fitness Tracker. Unfortunately, some device manufacturers do not allow Apple Health or Google Fit connectivity. They offer their own interfaces, with which Changers receives the distances traveled. In the Changers CO2 fit app you can find in the tracking settings the manufacturers Garmin, Fitbit and Misfit. For Garmin users, we offer the selection of distance tracking separately for running and cycling. The routes are measured on the respective Garmin device and transferred to the Garmin Connect app, from where the data is synchronized with Changers. For Fitbit and Misfit we only transfer the distances covered on foot. Manual input via the Challenge Page in the browser. Our corporate customers all receive a challenge page on the net. The participants can also enter routes manually with the respective date. It is possible to record both the distance traveled and the distance traveled by bike, as well as those by car, bus, train and plane. Moves is gone, we are challenged and working at full speed to get a fully automatic tracking technology under the hood of Changers CO2 fit app. We have already found a promising partner and are working feverishly to publish a first version by the end of October. So stay curious. You need more information or you want to start a corporate challenge in your company? Write us. PreviousChangers radically simplifies access to digital solutions in workplace health promotion. NextThe 10 health promotion surveys you should know!